The Viewership Battle Continues: The End of Ramadan? A few days ago, we discussed the initial indicators for this Ramadan’s top watched TV Shows of the season, and today, we’re taking a second look to see whether or not our first impressions have lasted. So who do you think took over, and who has managed to retain their position? Now that the first week is up, we see that rankings in the female scene have changed, and Ghada Abdelrazeq is beginning to reign supreme. Her show, Ded Maghool, took a turn for the better in the fourth and fifth episodes making it much more interesting. The added drama and suspense, as well as Ghada’s stunning performances, have allowed her to lead the social media scene, with content from the 4th and 5th episodes of her series going viral on Facebook. Throughout six episodes, and along different YouTube channels, the show got well over 6 million views. 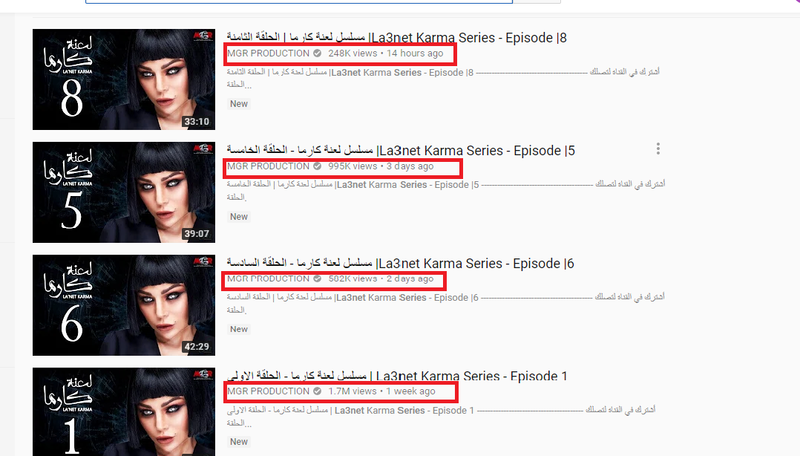 Despite Ghada picking up the pace, Haifa Wehbe’s La3net Karma has garnered about 5.5 million views on MGR Production’ YouTube Channel, and around 1.2 million views on Al Nahar’s YouTube Channel, giving this series a whooping total of 6.7 million views. It will be interesting to see which show gets more views by the end of Ramadan. As for the male side of things, the competition is still on between Amir Karara’s Kalabsh, and Mohamed Ramadan’s Nesr El Sa3ed. While Ramadan has managed to maintain strong numbers throughout the first six episodes, it is actually Karara that takes the cake. They both have around 6.8 million views for their first episodes, but since then, Kalabsh’s viewership has been consistently higher than that of Nesr El-Sa3ed. Consequently, Karara now stands with just over 28.1 million views, while Mohamed Ramadan stands at 23.2 million views. Let’s see if Karara can maintain that lead till the end of the Holy Month; perhaps this would be the end of “Ramadan”.